This is a week in which I have been insanely busy with very little time spent at the loom. My pre-trip preparation has kept me busy at the keyboard making arrangements, digging through the closet to find the warm clothes, dragging out backpacks and bags, warping projects and gathering sticks to take on the road. I washed and pressed my finnweave piece and was pretty happy with the result (wet finishing always makes me nervous). I wove a simple strap and now need to decide how to put it together. I also warped up a bright striped piece for a tote bag project but simply couldn’t live with the color arrangement. I have to confess that I hadn’t put a lot of thought into how I arranged the stripes and that has now come off the loom. 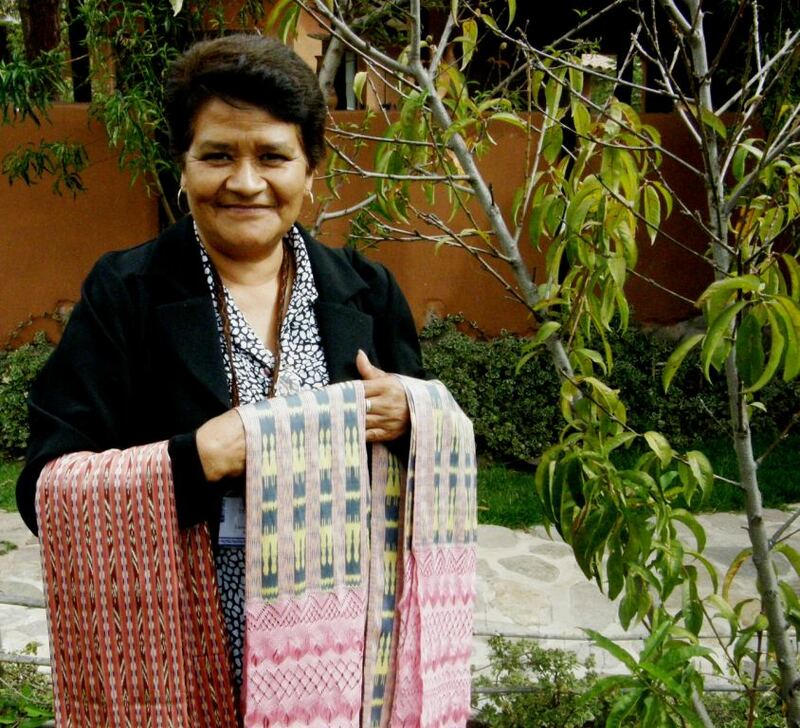 And then came an email from Eladio in Mexico sending me a link to a video showing the rebozo weavers of Santa María del Río, San Luis Potosí knotting designs in the warp ends of their shawls….stunning! At the Tinkuy de Tejedores, in Urubamba Peru last year, one of the presenters was a weaver from this very place…Luisa Govea, pictured at left, with some of her work, is known as one of the most highly skilled weavers of silk ikat rebozos using designs from the 17th , 18th and 19th centuries. 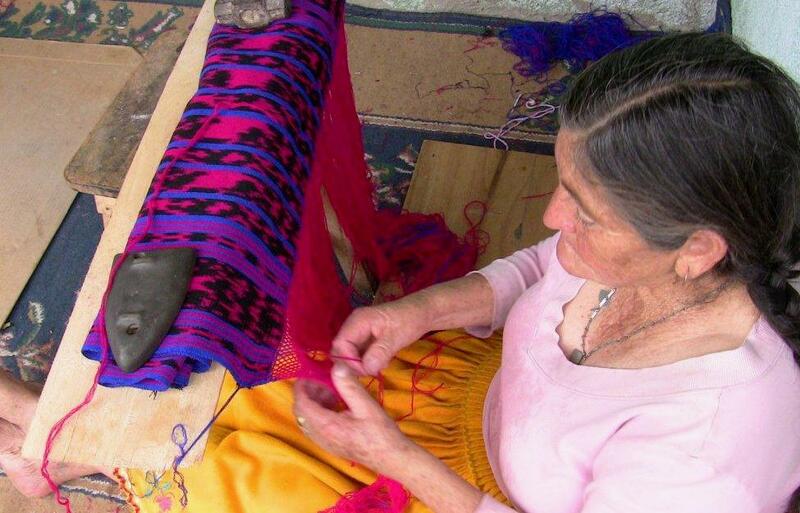 Carol Ventura has a web page with pictures from the backstrap weaving school in Santa Maria del Rio where many of these shawls are made. 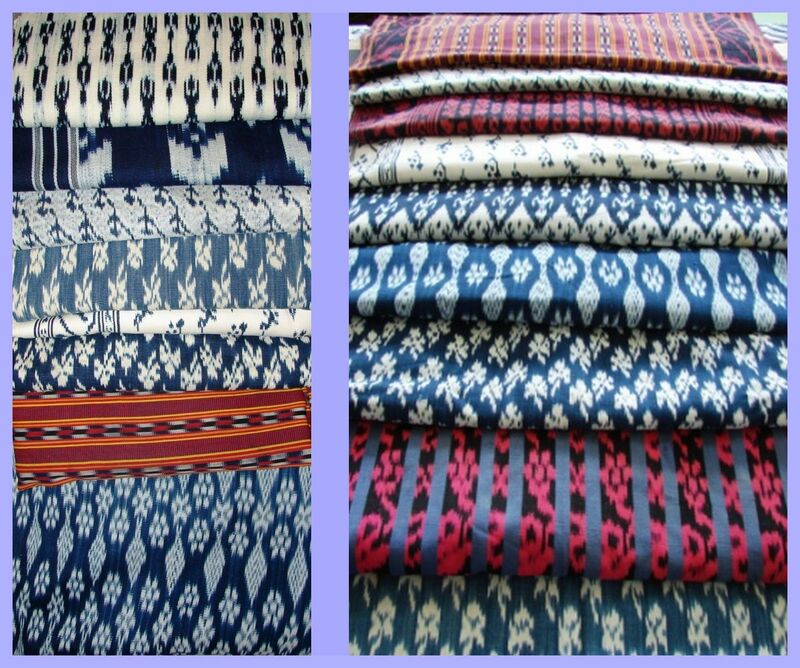 This reminded me that I also have a lot of photos which my online weaving friend, Phil sent me of ikat shawls in the collection of the late Dennis Penley. 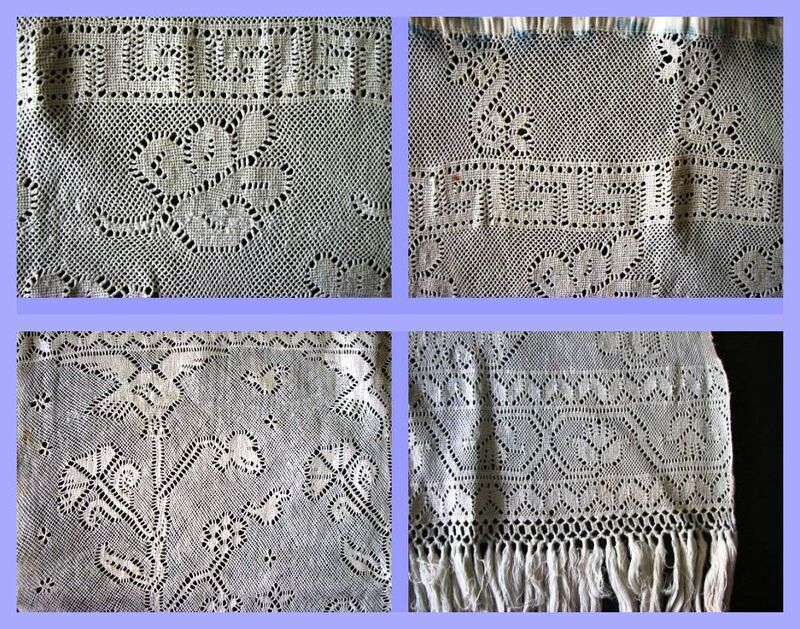 These also have magnificent designs which are created by knotting the warp ends and sometimes even embroidering on top of the knot work. 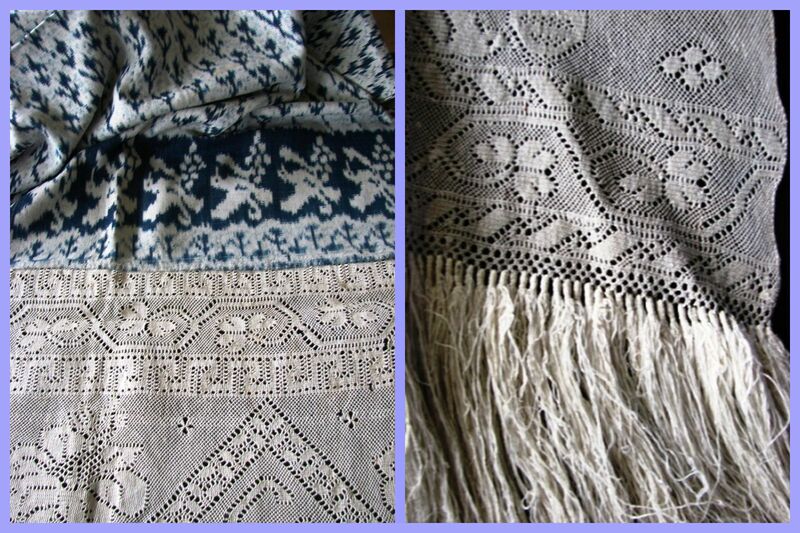 These shawls are from the towns and villages around Cuenca in Ecuador. 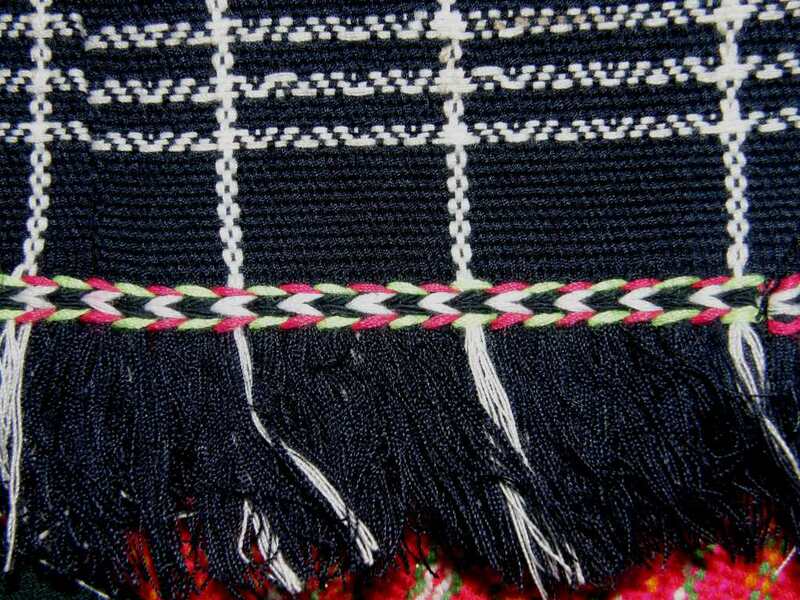 Whether the knotting technique used by the weavers in Mexico and Ecuador are the same or similar, I can’t tell you. All I can do is watch the video in wonder and enjoy the images that Phil has sent me and hope one day that I may find out more about them on a return trip to Ecuador or, even better, on a first trip to Mexico. 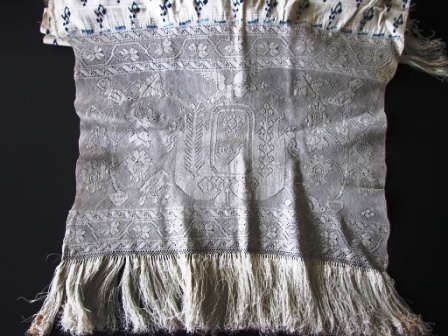 And now I can treat you to images of the designs on the fringes of ikat shawls of Gualaceo, Bulcay and other towns and villages around Cuenca in Ecuador…. More knotted fringes with their intricate designs…. Sometimes the designs incorporate words…. And here are details from various pieces…. Here are some more pictures, taken by Phil, of pieces in the Dennis Penley collection…. So, that’s it from me for this week. I wonder if any of you tried the weft twining that I showed in my instructional videos last week. I found a picture in my file of Montagnard weavings of some of the basic weft twining I showed in the videos…single rows of alternating colors and chevrons created by working four threads at once…simple but effective. 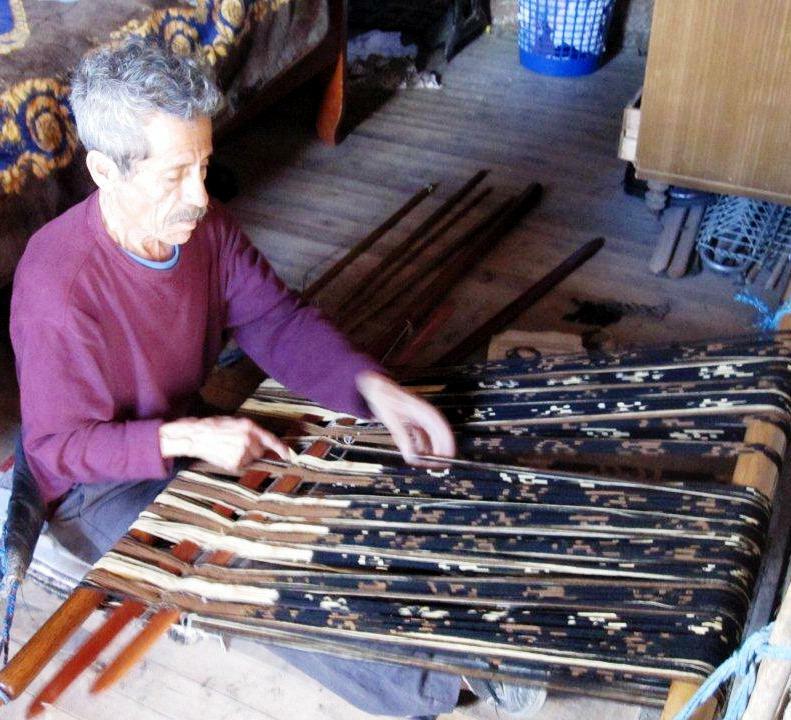 These stacked chevrons on the Bedouin weaving that Tracy in Qatar sent me are also very striking sandwiched between the multiple rows of single-color twining. 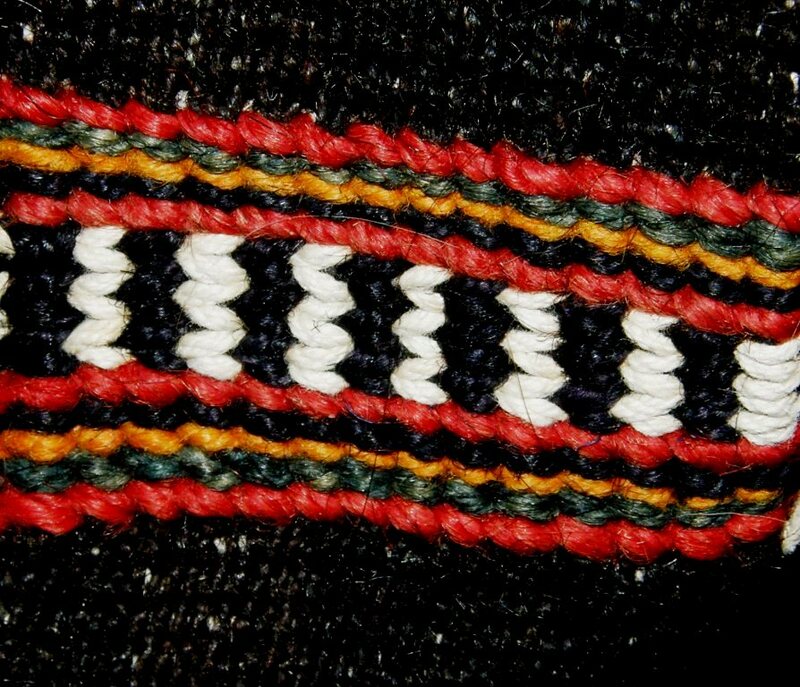 Maaike27 from Canada has been weaving up nice bands on a homemade inkle loom using many of the pattern charts that I have posted here on my blog. 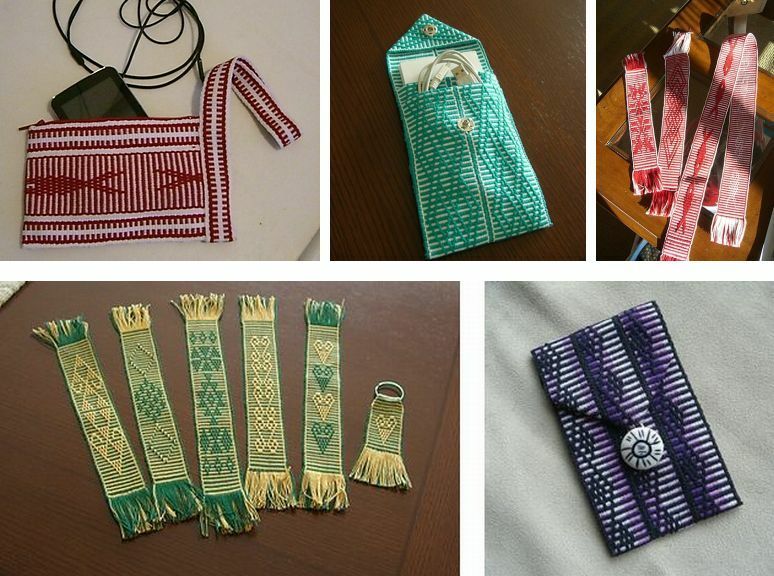 These bands have all been made with what I call the simple warp float technique and she has sewn them into a bunch of useful purses, key fobs, bookmarks and pouches. There has been action in the Ravelry group both in and around the plain weave weave-along but I am saving all that for next week. I will be leaving next week and hope to hit the northeast at the height of the fall colors. I arrived a wee bit late for it last year. I will try to keep up the posts while I am away but they may be a bit erratic. Their hands move so fast when knotting the rebozos. I can’t tell what sort of knots are being used! I wish tyhere was an extreme close up video of their hands going slow. I want to learn how to do this so badly! Beautiful work! Thank youfor allowing to see this Laverne! preciosos trabajos!!! !, gracias por compartir. un beso, cris. I’ve been blog stalking you for a while, but your last few posts have made me need to comment. I have indeed tried weft twining, since I really liked the idea of making a seamless bag, and I finished a sample just a little bit ago. My biggest complaint with it is that it’s such a slow technique, and I have the attention span of a cracked out squirrel, so….little bit difficult. I also have been dithering about trying to make a seamless bag using double weave with no motifs, because again, squirrel. I actually wanted to ask you about that a little, because I was wondering if it would be possible to put the two halves of each layer in their own heddles for weaving, and thereby not have to do pick-up? I’ll be trying the method anyway, but I keep flinching at the idea of separating out each layer by hand each time :P.
That is exactly what I did when I made the seamless tube pouch. Mine was purple and yellow so I put the purples from the two sheds in two additional sets of string heddles…way faster that way. I don’t bother separating the colors this way when I do pick-up motifs as I avoid having single color areas where the layers are not attached. And yes, weft twining is very slow but I love it! Wonderful! I’d hoped that was how you’d done it! I’m excited to make something useful, as opposed to strips of fabric that I pretend I might have the attention span to sew into something someday! 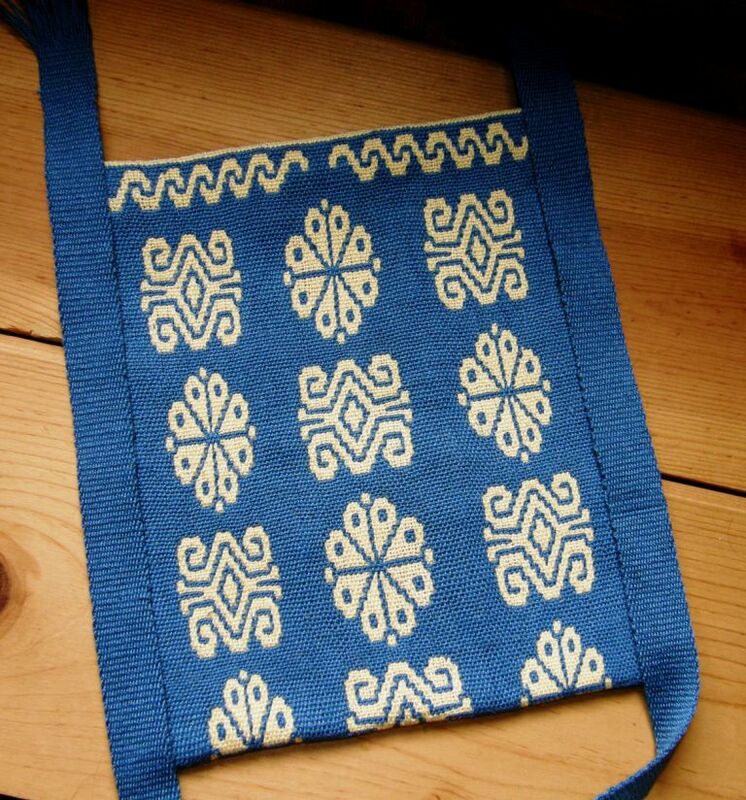 😀 I really do love the patterns you make with pick up too, but I have a thing for bags, so the more ways I can make those the better! I was actually surprised at how much I liked doing weft twining. There’s something very meditative about it, and it’s definitely one of my new favorite things. Which, as a side note, I would appreciate if you stopped exposing me to new things that are awesome, because I’ve only got two hands, and I sometimes have to eat and sleep.